Are you having difficulty visualizing your expenses in a Life Plan Community* as compared to staying in your current home? Without firm numbers and a full look at your current expenses, it’s hard to picture a community like Fountaingate Gardens as a good value for your money. Although in past blogs we’ve outlined the benefits of the various contracts and return of entrance fee options — and the lifestyle and future security benefits are obvious — sometimes it’s a challenge to see how this type of retirement living can actually be financially advantageous. Until now, we haven’t shared any pricing on our website; but that’s about to change. As you review the following charts, we hope you will better understand how Fountaingate Gardens can be a good financial fit for you. You’ll see that you don’t have to choose the highest cost contract to have access to all of the services and amenities Fountaingate Gardens will offer. Using the middle cost option – the Modified Contract option – we’ll illustrate for you the benefits it provides, not only in monthly/annual savings, but also additional healthcare security: you’ll have 60 days of assisted living and skilled nursing included at no additional charge AND a lifetime discount on these services, which can add up to significant value. The proceeds from the sale of a house are often used to cover the entrance fee when people make the decision to move into a Life Plan Community. For residents with high home values or additional assets, we offer some options that will increase your entrance fee while decreasing your monthly fee, if that’s a better fit for your goals and personal financial situation. That’s why a personal meeting with one of our Sales Counselors is so important, so we can discuss your individual needs and help you choose the plan that works best for you. In the meantime, the following two charts highlight projected monthly costs incurred while living in a private house compared to choosing a Modified Contract and living at the Birch residence, one of our popular one bedroom floor plans in the Parkview building at Fountaingate Gardens. This first chart highlights projected costs for a single individual. 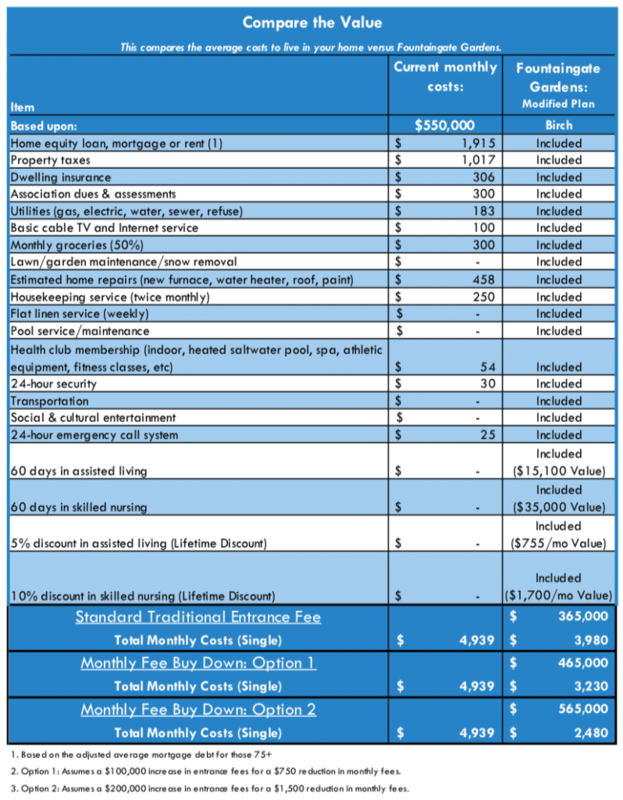 This second comparison chart shows projected costs for a couple in the same scenario. It is important to note a few items about the two charts above. First, notice that the entrance fee and monthly service package do not double for a second occupant – they increase by 7.48% and 22%, respectively. Second, the value of a Modified Contract at Fountaingate Gardens is increased by the healthcare included – as previously mentioned, there is built-in access to assisted living and skilled nursing care /rehabilitation for 60 days, and a lifetime discount thereafter, if those services are required. 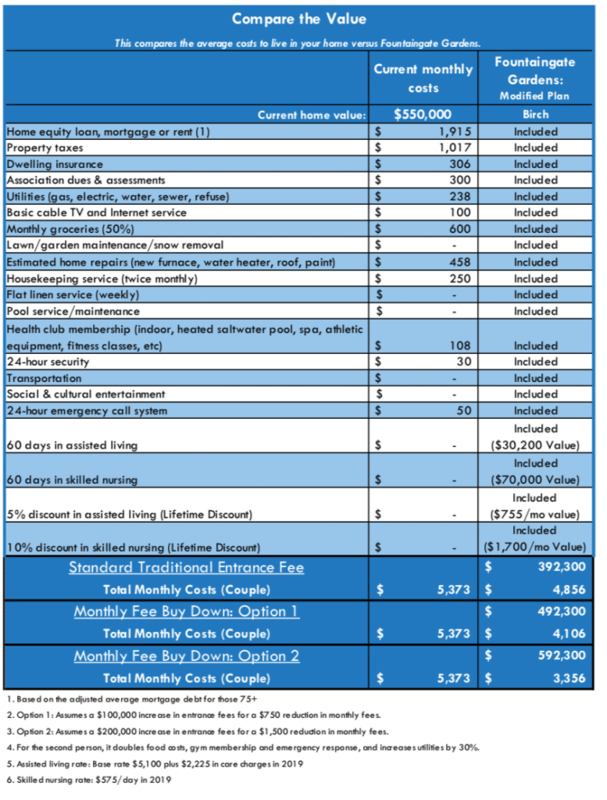 We feel it is important to share these numbers so prospective residents can see the real value of a move to a Life Plan Community by highlighting the actual costs for one particular scenario. These prices do change based on the residence and contract option selected, so the best way to get a personalized quote is to meet with a member of our team, who can help you customize the options to best fit what you envision for your future. And don’t forget – the decision to move to a Life Plan Community is not a purely financial one– the peace of mind and lifestyle add a value that is priceless. Call us today at (631) 715-2693, or click here to schedule your appointment.